J.D. Power, a global marketing information services company providing performance improvement, social media and customer satisfaction insights and solutions announced today that Â new-vehicle retail sales in May have returned total sales above the 15-million unit selling level for the month. New-vehicle retail sales in May are projected to come in at 1,157,900 vehicles, which represent a seasonally adjusted annualized rate (SAAR) of 12.5 million units, the highest level since January. This will be the third consecutive month with retail sales in excess of 1 million units. Retail transactions are the most accurate measure of true underlying consumer demand for new vehicles. The full-size pickup segment is contributing to the overall strong sales pace in May, accounting for 11.4 percent of industry retail sales, an increase from 11 percent in April and up from 9.7 percent in May 2012. J.D. Power also reports strong demand for full-size pickups is helping to keep industry average transaction prices at record levels. The average transaction price for all new vehicles thus far in May is $28,921, the highest ever for the month of May and 3 percent higher than May 2012. Several components are contributing to strong industry transaction price performance, including: low interest rates, which help keep monthly payments low; the use of extended-term vehicle loansâ€”72 months or longerâ€”which also help reduce monthly payments; strong used vehicle values, which equate to more trade-in equity; and strong new-vehicle residual values, which lower new-vehicle lease payments. 1Figures cited for May 2013 are forecasted based on the first 10 selling days of the month. North American light-vehicle production year to date through mid-May is up 4 percent, compared with the same period in 2012. Most major manufacturer volumes are either flat or up slightly, with the exception of General Motors, which is down 4 percent on the transition of the Impala and weaker large SUV sales ahead of the new models for 2014. Vehicle inventory levels in early May are at 3.2 million unitsâ€”a 63-day supplyâ€”and consistent with the current level of demand. Inventory was at a 55-day supply in May 2012. LMC Automotive is increasing its forecast for 2013 North American production to 16.0 million from 15.9 million units. With this increase, 2013 will mark the first time production in the region has been at the 16 million-unit level since 2002. In another dimension drivers are as capable as a space-shuttle orbiter pilot.Â Roads are dry as a bone. The only congestion on them is for those who have the sniffles. Occupants are light as feathers. Heavy cargo: there isn’t any. There the conventional wisdom of rear-wheel drive for optimal vehicle control works just fine. Reality check: Each driver thinks he is better than the other. Laws of gravity, inertia, friction and jurisprudence apply. Living in the same city for 40 years some folks are still lost without a GPS based navigation system. It rains. It snows. Salty melt splashes. Then it ices over. No single known rubber tireÂ copes with it all. The First Lady is fighting an uphill battle trying to get Americans lighter.Â And everyone thinks themselves part of TV’s “This Old House” team. One solution: front-wheel drive (FWD). Where plenty of vehicle mass lies atop the steered wheels. Wheels are already tilting and turning. So throwing abrupt spin can result in an instability aka torque steer. Equal length axle half-shafts and mechanical / electronic differentials help up to a point.Â However, power is wasted and under-to-oversteer issues for vehicles with sporting aspirations can’t be excised. To the rescue: all-wheel drive (AWD). OUT are the heavy mechanical transfer cases. IN are electronic or hydraulic center viscous differentials splitting the power between front and rear.Â The barest slippage is picked up by stability control / yaw / ABS sensors.Â Power to a given wheel can be cut imperceptibly fast. The best part: modern AWD nominal weight and cost. 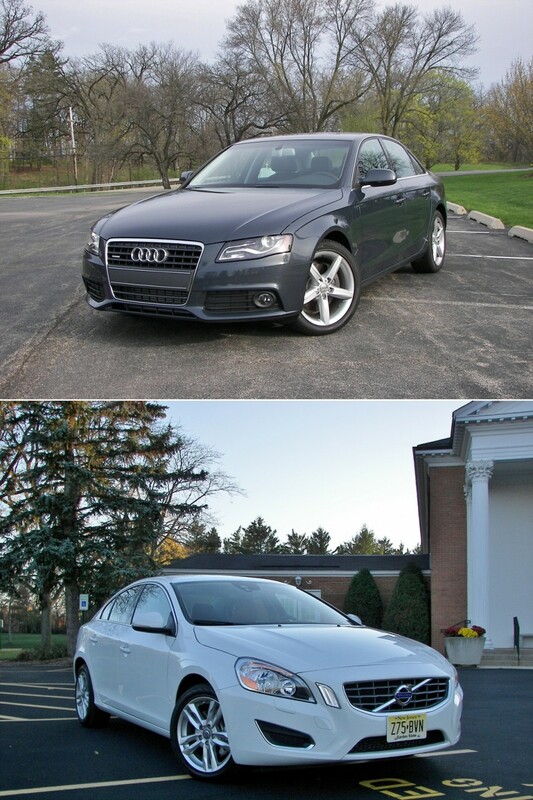 – Both Audi A4 Quattro and Volvo S60 T5 AWD have roots in front-engine, front-drive luxury executive sedans. – Dimensionally both sedans are rated as “compacts” by the United States EPA.Â The S60 is marginally wider and taller. The A4 is a couple inches longer good for 1″-inch greater wheelbase at 110.5″. Which begets the Audi 2″-inches of extra legroom in the aft. So how does the A4 make anywhere from 1″-2″ greater headroom? If there’s a thinner seat cushion, it could have fooled us. – The Audi keeps up with the Volvo from nil to sixty miles-per-hour. Call it 7 seconds. From there on up it’s all Volvo. The smaller-engined A4’s combined 22 miles-per-gallon edges out the S60’s 21 mpg. – the Volvo aligns its engine “east-to west” (transverse) ;Â the Audi makes room for a “north-to-south” (longitudinal) installation. – Audi Quattro employs a locking Torsen mechanical center differential. Torque splits 40/60% between front and rear wheels. Slipping wheels get a power cut courtesy of e-mechanical differentials between half-shafts. – Volvo’s Haldex 4 AWD set-up features a viscous center diff. Nominally the F/R power split is 95/5%. In hard turns there is an imminence of abrupt rotation in the S60 T5. And then, as up to 100% up power jumps rear-wards in a micro-second…your A#$ is saved. – Among the last of a dying breed is the Volvo S60’sÂ inline-5 cylinder 20 valve gas engine. For just 2.5L of displacement, direct injection and forced induction co-develop a robust sounding 250 horse-pressure and 266 pound-feet of torque. Audi, which proliferated five-bangers back in the day, adds variable Valvelift to the DI VAG EA888 TFSI 2.0 gas straight-four mill. The result: 210 gallopers and an impressive 258 lb-ft worth of “Whirling Dervishes” at a Mariana Trench low 1500 rpm. Sounding less imposing than the Volvo I-5, the Audi four-banger remains a paradigm of small engine refinement. – Both these European executive saloons transmit power by hydraulic torque converter gearboxes with manu-matic modes. Audi’s ZF 8-speed unit has two overdrive gears over the Volvo’s Aisin 6-speed. On hard throttle the Volvo slushbox becomes momentarily lost. The Audi eight-speed is creamy all the way. – Our A4 tester had handsome magnesium steering wheel mounted paddle shifters; the S60 gets an illuminated crystal-clear console gear shift-lever head. – Different front ends beget a different ride. The Volvo S60 T5 has a strut / lower control arms; the Audi A4, upper A-arm, two lower-links, and an upper link. The S60 dampers react quickly producing some jarring over broken tarmac.Â Suspension rebound in the A4 is less abrupt. Serving up more roll and dive, the Audi chassis communicates more clearly. – Steering in the S60, lower in amount of assist boost, requires heavier a heavier hand. Though, the driver is grabbing a steering wheel that is as substantial as they come. Audi fitted a quicker 16:1 electric assist to the A4 rack and Shazam: there is genuine feedback. – The Volvo’s four wheel disc brake binders may have the greater initial brake force, while the Audi has larger diameter front rotors (12.8″) with more consistent and linear pedal feel. – The S60, arguably, is blessed with the most dramatic, somewhat aeronautical, design here. So why is the Volvo so anonymous? Chalk it up to two decades of boxes-on-wheels. Audi launched front LED parking lights almost a decade ago. And the no-less-sleek A4 demonstrates that the company does that feature better than anyone else. Looks nothing like its distant ancestor the Volkswagen Dasher, though it can’t conceal elements of the European VW Passat B6.5 in the nose and tail sections. -Â the S60’s sloping roof-line bent on vying for coveted “four-door coupe” status is a threat to taller folks out back. You should have seen our cameraman’s had tilted sideways against the roof headliner to capture cabin shots from the back seat. The A4 verges on mid-size classification. Despite that Zugspitze of a rear seat transmission hump. – Slip inside either of these luxury sport sedans and the reaction is “Aha. They get it. Driver’s controls designed around drivers.” So the 7″-inch infotainment displays may not make the Cinemascope cut of some 8.5″ or 12″ units out there. And we thought instrumentation was intended to inform rather than overwhelm and distract. The Volvo gets the nod for cluster dials which speak Rolex. And the Audi a horn-toot for it’s MMI (Multi-Media Interface) center console rotary controller. An abundance of forest-sparing turned aluminum takes its turn as “bling” throughout both cabins, even if someone at Audi got carried away polishing the stuff. The contrasting tan on black treatment in the S60 promises there will never be a dull moment. Switchgear, plastics, fabrics and even the short pile carpets lining the trunk of the A4 could survive in a Bentley. And they probably have. – Volvo designs automotive seats like nobody’s business. Possibly racing Recaro’s and Sparco’s excluded. The S60 bucketsÂ meld with torso and extremities. Audi threw in the optional Sportline seats on our A4. More size accommodating than the S60 perches, they also feel more yielding. Hides feel sourced from cattle which received daily rub-downs. One look at the rear passenger confines in either A4 or S60 and it’s apparent that front occupants get the better deal. Neither is as well-suited for cross-country five-adult road trips as a 1973 Oldsmobile Vista Cruiser. Either 12 cubic-foot trunk will tidily accept a weekend getaway’s worth, with the Audi offering the widest aperture for load convenience. And both offer split folding rear seat-backs. It’s becoming harder to justify luxury crossover utility vehicles when they approach nearly half-the-price-of a modest-home. The day has arrived when many premium and some standard-line crossovers have blurred the lines. It shows that the artiste responsible for the new Santa Fe interior has ridden around in some of the industry’s more esoteric cabins. The swoosh theme from out extends inside to appliques of pseudo-chrome and simulated wood. Grained soft-touch plastics are abundant at or above eye-level.Â From knees and below trim can get natty. Doors close firmly in the way of old Swabian exports. This “import” (with 53% Korean content) is assembled at the Kia Plant in West Point, Georgia. A cabin stuffed with more sound absorption stuffing than a Thanksgiving gobbler is remarkably indifferent to wind and road noise. The 550-watt Infiniti Logic-7 sound system, replete with sometimes irascible bass and a dilly-dallying volume button, is all the more listenable. Pleasantly tactile with organic shapes and positive action is how we rate Santa Fe Sport switchgear, extending to the handsome steering-wheel boss. The properly-sized heated helm tilts and telescopes, is kid-skin delectable-to-touch, though treacherously slippery in switchbacks. Each successive tweaking of Hyundai’s hour-glass center stack relieves button-switch congestion. In contrast, the agglomeration of icons nestled in the menus of the Santa Fe’s 8″-inch touch infotainment/ HDD navigation screen begs for a rotary dial / joystick type controller. At least a decidedly broader voice-command repertoire. Finger-tapping on the move will eventually buy you a traffic citation for distracted driving.Â Hyundai Blue telemetry apps makes for streamlined bragging on fuel economy to other Santa Fe owners. Bathe in indigo back-lighting. Front seats have heaps of padding in the cushion. Satin-finished leather upholstery enhances grip. The Santa Fe driver benefits from full power adjustments, lumbar inflation included, with a two position memory for seat and wing mirror positions, heating and cooling. A veritable “Drive Number” seat. With 39″ of vaulted-ceiling not even six+ footers feel stifled. The seats of our pants told us to set the “bun-warmers” at their lowest position else become introduced to the realm of solar plasma. In preparation for the upcoming seven-passenger Santa Fe, the Sport’s second row bench splits into two sliding segments maximizing either occupant comfort or cargo capacity. Legroom stretches to a BMW 740i besting 39.4 inches. Behind-second row storage is a cetacean 35.4-cubic-feet, splitting the difference between a Ford Edge and full-size Ford Explorer. Fold the 40/20/40% split seatback to double the load. 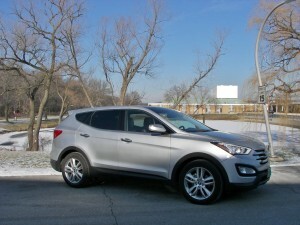 Some 5″ shorter in wheelbase than the Nissan Murano, the Santa Fe Sport shortens turns by 2″-inches. There’s the transverse Hyundai twin-scroll-turbocharged, direct-injected 2.0-liter twin-cam gas inline-4 hooked up to the company 6-speed manumatic front-drive slushbox. We’ve seen this duo before. In the Kia Optima sedan. Where throttle tip-in resembled “turbo-lag” and a flat sound bordered on buzzy. Transplanted to the Santa Fe, power drops 4% to 264. Torque stays put: 269-pound-feet @ 1750 rpm. Couldn’t tell ifÂ “buzzy” was eliminated because cold weather precluded opening windows. Final drive has been shortened. An upshift happy gearbox couldn’t prevent high-7 second 0-60 mph times. Combined fuel economy of 20 miles per gallon in the Santa Fe Sport is a real improvement over the six-cylinder competition. Ripe for a “Biggest Loser” nomination is the Santa Fe Sport’s 260-pound weight loss. The 3570-pound crossover tipsÂ scales at barely 140 more than the mid-size Hyundai Sonata sedan. Body motions are damped for reduced rebound inviting some tail twitchiness. Our tester, riding on 19″ alloys bound in 235/55 Continental Crosscontacts, was resilient in the face of all but the worst road chasms. Three levels of electric power steering assist are democratically available. Skip two steps ahead ofÂ yo-yo resistance and head straight for “Sport,” a land of meaningful heft and less slop. Standard stability and traction control unobtrusively went about their business during a few less-than-major snow events in our time with the Santa Fe Sport. Traditionally a chink in the Hyundai interpretation of “Halt,” an ABS and brake force distribution fortified four-wheel disc brake arrangement generates firm levels of pedal feedback. It’s Not $5 Grand Pricier?